Movie star Leonardo DiCaprio’s Malibu dream house hit the market on Friday, listing for $10.95 million. Leo purchased the midcentury California bungalow (can you still call something a bungalow when it costs more than $10 mil? The jury is out!) back in 1998, and the three bed, two bath home is a beaut. It’s on star-studded Carbon Beach, the views are killer, and the interiors are gorgeous. 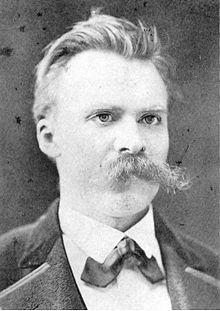 As we sigh, we might send nihilist birthday greetings to Friedrich Wilhelm Nietzsche; he was born on this date in 1844. A philosopher, poet, composer, cultural critic, and classical philologist, Nietzsche is probably best remembered for his concepts of the “death of God”, the Übermensch, the eternal recurrence, the Apollonian and Dionysian dichotomy, and the will to power… which, among them, have had an extraordinary impact on thinkers as diverse as Martin Heidegger and Ayn Rand on the one hand, and Michel Foucault (whose birthday this also is) and Jacques Derrida on the other. When someone hides something behind a bush and looks for it again in the same place and finds it there as well, there is not much to praise in such seeking and finding. Yet this is how matters stand regarding seeking and finding “truth” within the realm of reason. If I make up the definition of a mammal, and then, after inspecting a camel, declare “look, a mammal’ I have indeed brought a truth to light in this way, but it is a truth of limited value.